It comes but twice a year. Yes, that's right, fashion week (well, actually month as there are four weeks in all, people), is officially here. And not to panic you, but New York Fashion Week starts tomorrow. Just how well do you know fashion week and the people that go with it? Can you spot your blogger from your street style star? Tell the difference between a designer and a photographer? Know which A-listers are set to grace the front row? 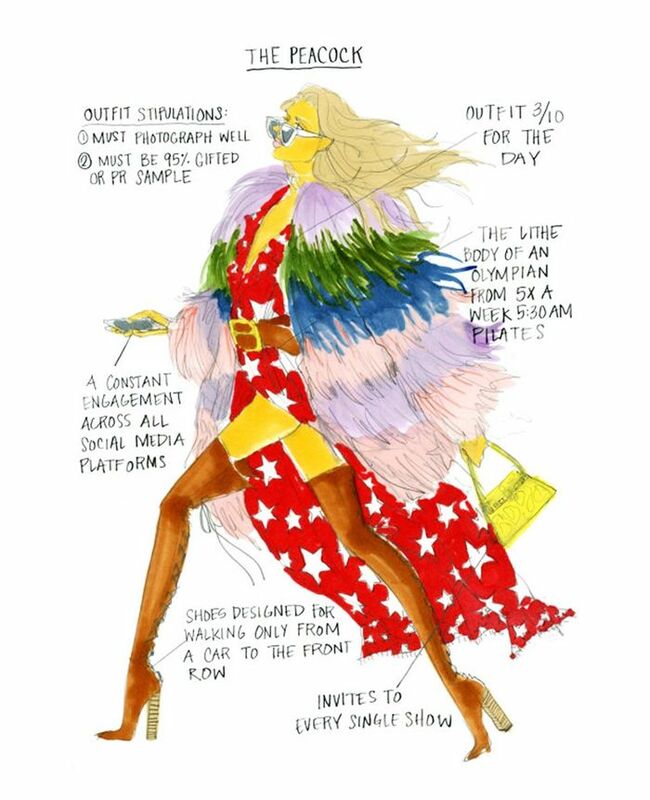 Fear not, as that's all been decoded for us in a tongue-in-cheek manner by Stylebop, with the help of genius illustrator Julie Houts. In a series of cool pictures, Houts has got the people of fashion week nailed. From the peacock, who needs to make 10 outfit changes during the day, to the publicist who has a constant headache, as well as the “I'm just here to do my job attendee,” who, gulp, reminds us of ourselves, these are hilarious depictions of the kind of people at the shows. But it's not just the kind of fashion insider that Houts has astutely observed, there's also the kind of situations we all find ourselves in during the week. Whether that's gorging yourselves on free popcorn (there's always popcorn) because you've been busy rushing around or not being able to get into the after-party, these pretty pictures are funny because, quite frankly, they are an honest look at the madness that is fashion week. Keep scrolling to take a look at the illustrations below. That coat is totally fabulous though. Note how one person is napping. Hey, you do you. Possibly the toughest job during fashion week. Eat all of the popcorn. We've actually seen this IRL. We've never tried this (and won't ever), but genius idea. Which one would you be? Tell us in the comments!